TRANSFORMATION. Vision 2025 is all about transformation - transforming people through God's Love and Word expressed in their language and culture. Vision 2025 is a global strategy with the goal of having a written translation of the Bible started for every language and mother tongue around the world by the year 2025. This is a joint effort by many Christians with a passion for God's Word and their world. One of our partners is Wycliffe Bible Translators. We have worked among the Nalja tribe of Papua, formerly Irian Jaya, Indonesia since 1975. Statistically, Indonesia is the most critical part of the world for Vision 2025 partners to meet the target because of the more than 400 mother tongues without their own Bible. When this need was identified, new methods to penetrate these unreached peoples began to be developed. "Mother Tongue Translation" (aka MTT) was established and is based in part on the principle that people naturally gravitate towards others that originate from the same place as themselves. 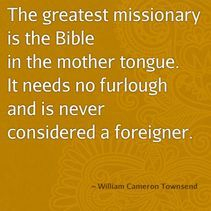 MTT has become the overall process of locating, recruiting and training indigenous peoples of a land to translate the Bible into their own mother tongue and dialects and/or those that are similar to their own. This is the most effective means to expedite Bible translation as it helps to eliminate language and cultural barriers that hinder most traditional missions and translation projects. It also allows us to concentrate our efforts on recruiting, training and overseeing the critical field work. We are available to share our passion for Vision 2025 and Bible translation with any local church, group, conference or media outlet around the world. For further information, connect with or contact us. We are particularly interested in meeting and motivating those who will pray faithfully and might consider expressing their faith by using their own language skills to translate the Scriptures.